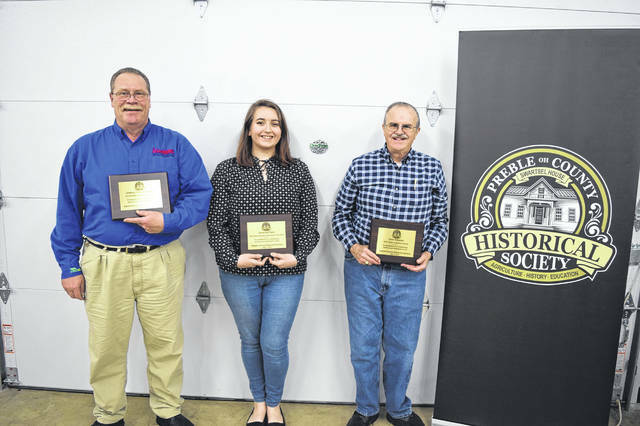 The Preble County Historical Society (PCHS) named its 2018 Annual Award Winners during the annual meeting on Sunday, April 7. Pictured are Kent Stonecash, Savannah Flack and Dave Edwards. EATON — The Preble County Historical Society (PCHS) named its 2018 award winners during its annual meeting on Sunday, April 7. Lowman Heating and Air was named the PCHS Business of the Year for donation of the HVAC System for the PCHS Exhibit Hall. “This was a huge donation, because now Preble County Historiy is protected and preserved for generations to come. A big thank you to Kent and Wendy Stonecash for everything you guys have done,” Executive Director Misti Spillman said. Dave Edwards was honored with the Years of Service Award. “Dave is a great volunteer, especially during our summer events at the historical society. He takes on the task of helping with parking. Dave has also been a member of PCHS for the past several years. This organization could not do any events without our core volunteers, and Dave is one of those volunteers. He is also involved in our monthly antique group,” Spillman said. Savannah Flack was honored as the Sara Swartsel Volunteer of the Year. “Savannah has helped the past couple of years and has gained experience in our collection, with displays and also preservation. She was a tremendous help last year with our Exhibit Hall, she came in several times and helped me with cleaning the artifacts and so forth,” Spillman said. Earlier in the meeting, Spillman gave her annual report, including reporting on the renovations of the Exhibit Hall and new events. She spoke about the Exhibit Hall and the $50,000 grant which made the renovations possible. The grand reopening of the space was last September. She also spoke about the Haunted Trail held in October. October is busy for the historical society, as it host its Cemetery Tours, Ghost Tours, and now the Haunted Trail. PCHS hosted this new event two Fridays, and it unfortunately rained during most events. However, the turnout was still great, according to Spillman, with 80 participants one night and 150 the next. This October, PCHS aims to host the Haunted Trails two weekends. Two years ago, PCHS bought signs for Ohio 122, but had to check with Ohio Department of Transportation to put the signs in the right of way. Finally, PCHS received approval to install the signs in April. PCHS also hosted the Back to the USO WWII event in December in the Exhibit Hall. There was a live jazz band, auction, and WWII reenactors. •History and Etiquette of Tea Luncheon on April 14. •Preble County Historical Society Vintage Days on June 29. •Old Fashioned Independence Day Celebration on July 7. PCHS will not be hosting Bridges, Bikes, and Blues, but hopes to return to the event in the future. “We’re stepping back to reevaluate it and do it again possibly next year. In trade of that we’re doing a flea market here at the end of June,” Spillman said. https://www.registerherald.com/wp-content/uploads/sites/41/2019/04/web1_PCHS1.jpgThe Preble County Historical Society (PCHS) named its 2018 Annual Award Winners during the annual meeting on Sunday, April 7. Pictured are Kent Stonecash, Savannah Flack and Dave Edwards.